Case, 7102 Micro-Bath Carrying Case. Padded, with compartments suitable for the model 7102 bath. 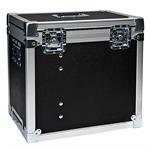 Case for models 4180-81 infra-red calibrators. Rugged, padded carrying or transport case.